Today I’d like to present a new toy for you–the AtD Bookmarklet. With it, you can click “Add Proofreader” from your bookmark bar and an AtD button will magically appear above every text area on the current page. 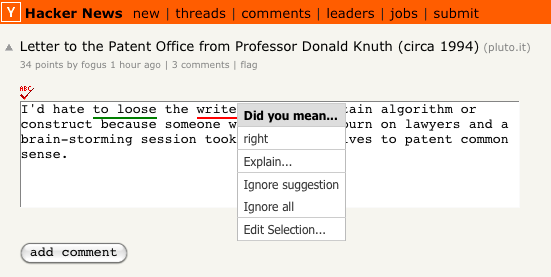 You now have the ability to check spelling, grammar, and misused words from your browser. You can get it here. What can you do with this new bookmarklet? 4. 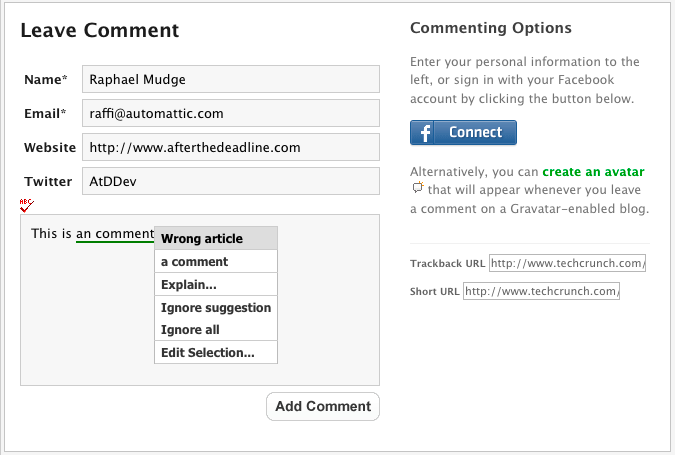 Spell check your comments–on any blog! This proofreading technology uses an open source back-end. We also have libraries for jQuery, TinyMCE, and CKEditor to make it easy to embed After the Deadline into your application. Chrome Update – I’ve received several reports (and have verified) that this bookmarklet does not work in Google Chrome. The AtD libraries work with Chrome and everything is happy when requests are to and from the same host. When I find a fix, I’ll post something here. Chrome Update 2 – After investigating with Google Chrome, I believe this bookmarklet communicates in a way that conflicts with Chrome’s pop-up blocker or browser security policy. Great one! It might be also a good idea to make a firefox plugin etc. which would automatically insert a spell check icon before every textbox and load the scripts on each page (which could be bundled with it, so loading time won’t be affected as the scripts would be already on local machine). Yeap, that was the *wink*. The work on it started last week. It’s in the public SVN repository and while we’ve twittered about it to get some feedback we haven’t announced it here yet as we have a few other things we want to achieve. It’s great work though. Thanks added a note to the post and bookmarklet page about this. This really needs to be a jQuery plugin. I love this! It is wonderful! Thanks. It means a lot to me when I know someone is happy with something I made. Nice now I can have a better spell checker then I have in Firefox. Looking forward to it being a plugin in Firefox. Great bookmarklet! Works fine in Firefox, Opera, and Camino. As reported already doesn’t work in Chrome but it also doesn’t work for me in Safari on Mac or Windows.